A minute break in my concentration reveals that the sun is oddly high in the sky. Crap, I'm late. I've to return the Ural, get back to work and then focus on sending the issue to the press... I'd better hustle. But turning the wick up on an Ural Retro Solo isn't simple. It simply isn't a Honda CBR650F where I'd just turn the throttle harder. The Russian, via 1940s Germany, motorcycle is made of sterner stuff. It manfully resists every attempt to rapidly shift up or down the gearbox with horrid graunching noises that aren't as much mechanical damage as they are fluorescent highlighter strokes on my inappropriate behaviour. Deep breath. Pull the clutch in once more. Wait a deliberate moment and try again. With the directness of well-aimed sarcasm, the gear slots positively with a solid clunk. The abundant torque surges even stronger. The speedo needle wavers about between 50 and 60mph instead of 30 and 40. I'd tell you what that is in kmph but the morning condensation has yet to reveal the kmph scale and I'm having too much fun to multiply everything by 1.6. The ex-BMW 745cc flat twin  now fuel injected, Denso alternator-ed but still dry clutched and air-cooled  has a distinct, quiet thrum that carries  people hear you coming. But when they spot you, you see a smile with a question mark in it. What in the world is that? The Retro Solo and its handful of two-wheeled cousins are relatively recent additions to the product range of the heavy duty sidecar maker from Russia. And they've been updated too  our bike has Marzocchi forks and Brembo brakes! The sidecars are phenoms, we're told. The two-wheel drive ones are nigh unstoppable and that was one of the requirements of the Red Army back in the 40s as they prepared to handle the inevitable Nazi expansion, ironically with a German design. The ex-BMW design and the Retro Solo's history of being the power unit of a sidecar endows upon it a series of delightfully odd quirks. The BMW bit comes from the longitudinal crank. The crankshaft has been updated from the original. But the rotation of the crank causes the motorcycle to rock gently to the right when you rev it up. Fascinatingly noticeable at idle, this rolling motion is mild and you won't notice it once the 4.00x18 tyres start rolling. 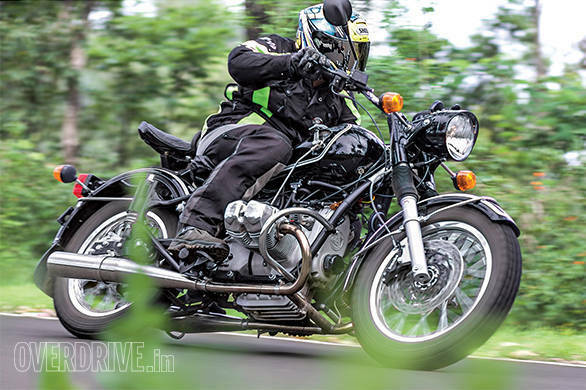 The sidecar brings the need for a reverse gear. The gearbox is actually a four-speed unit with an additional reverse. The former is operated by a conventional foot lever. Reverse comes from a wooden knobbed hand shifter on the right of the tank. As reluctant as the rest of the gearbox, it might require anything from a suggestion to an angry yank to shift from neutral to reverse (the forward gearbox must be in neutral). Then you just release the clutch and fall deeply in love with the odd sensation of your motorcycle rolling backwards on its own power. Makes you think anything over 150kg kerb weight should have a reverse gear. But with a 246kg heft  dry  the Retro Solo most certainly benefits from having a reverse gear. Add a sidecar and it's vital. Despite the sidecar origins, though, the chassis is startlingly normal, if old-school. 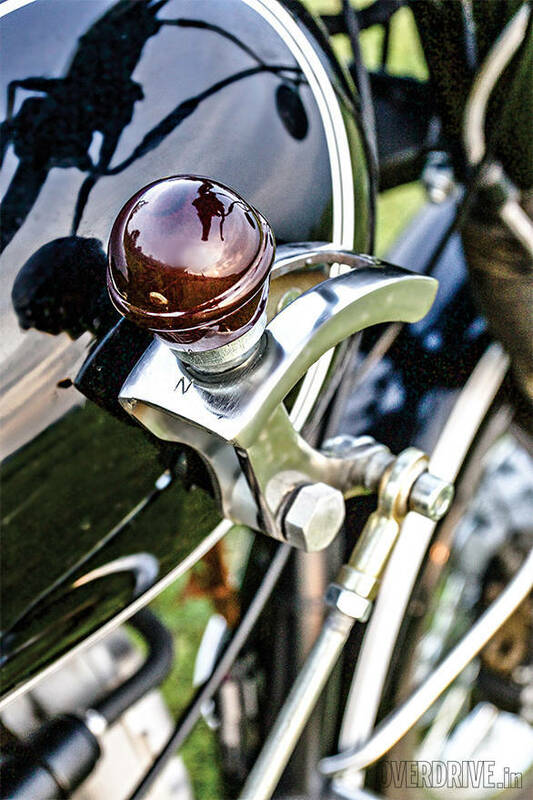 The tubular steel cradle has that straight edge that runs from the headstock to the swingarm pivot that old-school BMWs all had. The height of 30s-40s chassis design fashion, then. The sidecar rigs used the strong but imprecise Earle's Fork or other trailing link arrangements for the front suspension. 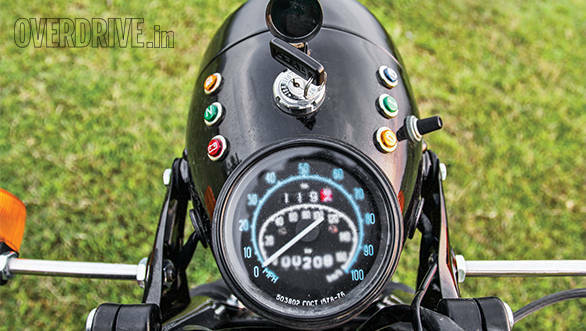 The Solo gets regular forks and interesting preload adjustable twin shocks that mimic the look of plunger units. Sturdy looking steel rims wearing 4-inch chunky treaded square profile tyres complete a picture of a workhorse built to last. Perhaps, it's that combination of equipment that led me to believe that cornering a motorcycle this heavy and long wouldn't be something to write home about. But I am surprised to say that the Ural manages. It isn't as precise as a current day chassis but it goes roughly where you intend it to. But it goes there happily and eagerly and that's what matters. The tyres do make themselves felt. The initial lean is reluctant but once on edge, it wants to lean all too eagerly. But usually, something scrapes at this point and prevents your enthusiasm from becoming a liability. 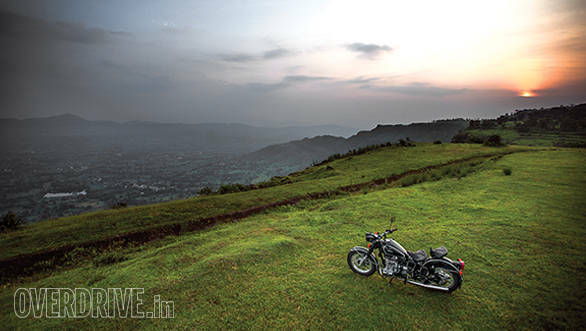 Once you settle into these sensations, the Ural can corner and twisty roads can be despatched quite rapidly. Ride quality has a similar rough-shod adequateness too. The sprung saddle generates a satisfyingly anachronistic sensation as you hammer through bad roads with the odd jolt or two but no complaints at all from the bike. Plush it isn't but unbreakable it almost certainly is. At this point, having realised my folly, I dial back the hustle and immediately, the Ural sort of gives me a warm hug. 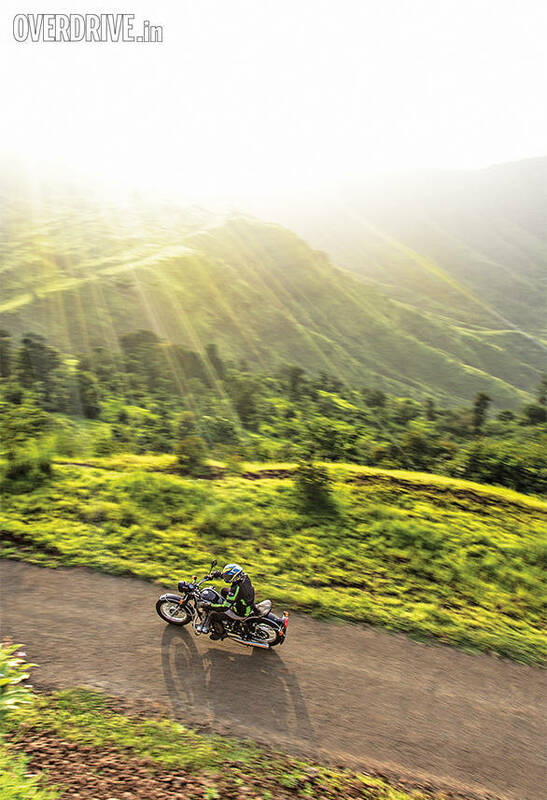 There's a lovely long-legged lope in that motor that'll make you want to cross continents at a pace which allows you to appreciate scenery without stopping or becoming part of it. That lope and that determinedly old-world feel has a slow-moving elegance that I found extremely attractive. IMZ-Ural, or Irbitsky Motosikletniy Zavod is the full name of the company that makes this, the Ural Retro Solo. Motorcycles are a recent addition to this long standing maker of sidecar rigs. The background to its story is the need for the Red Army to be mobile in the face of (coming, German) opposition and difficult terrain in the late 1930s. A motorcycle was part of this requirement. In 1940, the USSR came to own the design and know-how for the BMW R71  both bike and sidecar from Nazi Germany post the 1939 non-aggression pact. The bikes were supposed to roll out of Moscow, Leningrad and Kharkov but these were within the range of Luftwaffe's bombers, so the Moscow plant was later moved to Irbit in the Siberian Steppe, amidst the eponymous mountains and the other two to Gorkiy. Stalin was shown the M-72 sidecar prototypes and upon his approval, the sidecar entered production in 1942. A year later, in fact, after BMW closed R71 production and replaced that with the R75. Nearly 10,000 M-72s were part of the Russian WWII effort. In the late 1950s, IMZ-Ural started commercial civilian sales and by 1953, the Urals were being exported as well. In 1998, Uralmoto became privately owned. This caused a sea change including serious upgrades in quality while maintaining the outward appearance and feel of the typical Cossack motorcycle.